IDF, UNIFIL sweeping southern Lebanon for rocket launchers after sirens sound, explosions heard near Kiryat Shmona. Sirens sounded throughout the Upper Galilee close to 10:15 pm Monday night, just before a series of explosions were heard near Kiryat Shmona. The IDF confirmed that two rockets were fired from Lebanon at northern Israel. No injuries or damage were reported. The IDF “retaliated with artillery fire towards the source of the attack,” the IDF Spokesperson wrote on Twitter. Troops are currently scanning the Lebanese border, sources say, in cooperation with mediating body UNIFIL. 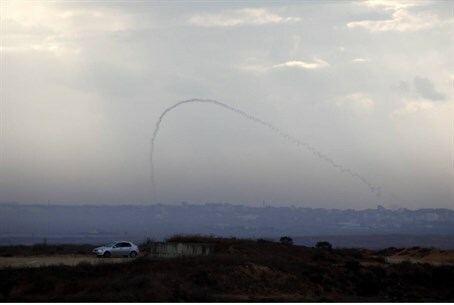 Just before 11:00 pm, unconfirmed reports have begun surfacing that the IAF has begun responding to the rocket fire. Since Operation Protective Edge began 49 days ago, at least ten rockets have been fired into Israel from Lebanon. The Lebanese Army arrested several terrorists involved in at least one salvo on the Galilee, but also complained to mediating body UNIFIL after the IAF responded to the attacks. Additional rocket launchers may have been found Sunday, according to foreign reports, following what were allegedly harsh words to Beirut, according to Walla! News, through which the IDF communicated through UNIFIL that it held the Lebanese government directly responsible for Saturday night's attack.